Launchpad couldn't import bug #283819 from KDE Bug Tracking System. 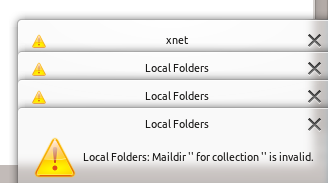 Local Folders: Maildir '' for collection '' is invalid. Probably doesn't break anything but is confusing for users. AkoNotes: Error opening ; this folder is missing. Fresh install of Kubuntu 11.10, running Kontact 4.7.2. Local Folders: MailDir " for collection " is invalid. Similar symptoms on Kubuntu 12.04. Fresh install of Kubuntu 12.04, Kontact 4.8.2. Multiple error messages when doing just about anything in Kmail (eg moving folders). Kubuntu 12.04.2, KMail 4.8.5. Mail folder from filesystem was imported in Akonadi. When I create a new folder, it is present in file system and writeable. I can move a mail in this folder. It doesn't get deleted in the old folder, I can access it in both the old and the new folder. MailDir " for collection " is invalid.